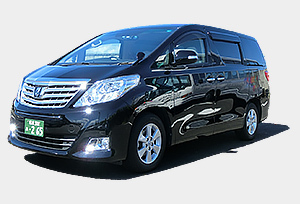 We have various types of vehicle available, among which you will surely find one suitable for your trip. 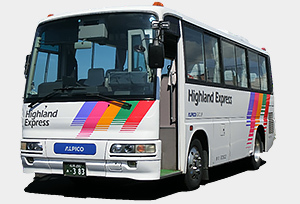 Table of estimated fares charged when you charter a vehicle to Hakuba from Japan's major international airports and Nagano station. 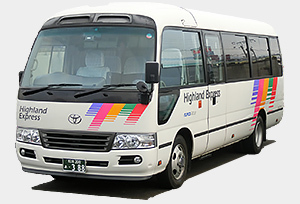 Table of estimated fares charged when you charter a vehicle to tourist attractions near Hakuba. 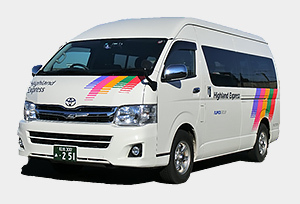 Our fleet can accommodate up to 24 passengers with luggage, up to 27 passengers without luggage. 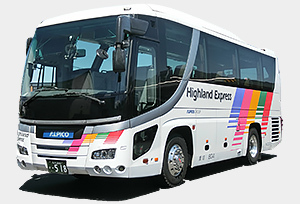 If your group is larger than the capacity mentioned above, click the button below to inquire about large-sized bus (45 seats). from Japan's major international airports and Nagano station. You can pay by credit card in advance (advance payment). 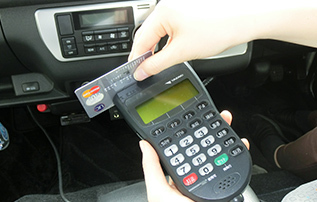 But if you choose to use a sedan taxi or a van, you can pay upon arrival by cash or credit card inside the vehicle. 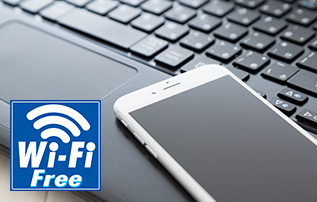 You can use Free Wi-Fi on the vehicle. 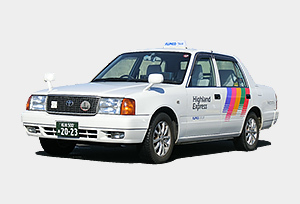 Our driver will be waiting for you at the arrival lobby (airport pick-up) or ticket gate (Nagano sta. pick-up) with your name on a signboard. 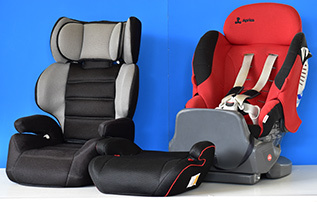 According to Japanese Law, you are not required to provide safety seats for infants or children but we can provide them if requested. Toll fares are already included in the price list above. Entrance fees to tourist attractions, for example the Snow Monkey Park. Cancellation must be made more than 24 hours in advance of your scheduled pick-up, otherwise you will be charged the full charter price. You can contact us by LINE, Messenger or by phone. We are sorry our drivers do not speak English. But we have prepared point-and-talk conversation sheets and a smartphone translation application to communicate with you. In cases where the above methods cannot help you communicate with our driver, please feel free to contact our office staff by LINE or messenger. What do we do if our flight arrives earlier or later than scheduled(airport pick-up)? Our drivers are responsible for checking your flight status and will wait for you at the pickup location according to your arrival time. Please let us know if you are aware your flight will be delayed, or is arriving earlier than scheduled. In these cases, we will try our best to accommodate you. Additional parking fees or other expenses may be charged in this case. Where is the meeting point at Narita and Haneda airport? 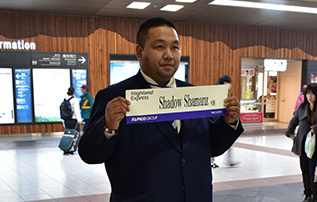 Our driver will be waiting for you outside the arrival gate with your name written on a signboard. How do we contact you on the day of travel in case of emergency? If you have already booked our service, you can reach us by using LINE, Messenger or by phone. On the way, can we stop for a lunch/toilet break? Yes, please feel free to let us know if you need to take a short break. I would like to know more about the reservation and payment process. Please fill in the reservation form with as much detail as possible and submit it to us. Our staff will contact you shortly. We may inquire about further details if necessary. If your desired route is not included in the reservation form or if you have any other requests, please write in the "addition requests" field in reservation form. Can I pay on the day by cash? Although we prefer advance online payment by Visa or MasterCard, we also accept payment on the day by cash (Japanese yen only). by using smartphone application. Download it now! Click one of the buttons below to get the App!